Shining a light on my 400th post! Trust me, NO ONE is more surprised that I’ve posted 400 times here than Yours Truly. 400? Really?? Have I actually had something worth sharing on 400 separate occasions? Well, for better or worse, I have indeed, published 400 posts…and today of all days, I DEFINITELY have news worth sharing! 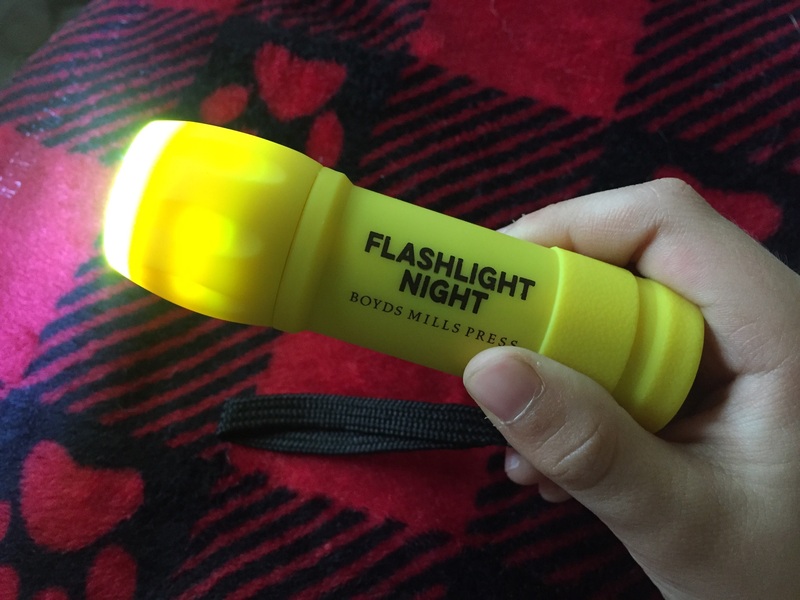 This little fellow arrived in my mailbox the other day…a special promotional item from the publisher of Flashlight Night, Boyd’s Mills Press. I don’t know the exact number of flashlights they ordered, but it’s enough to share with a whole bunch of book purchasers (librarians, stores, etc.) all over the country! 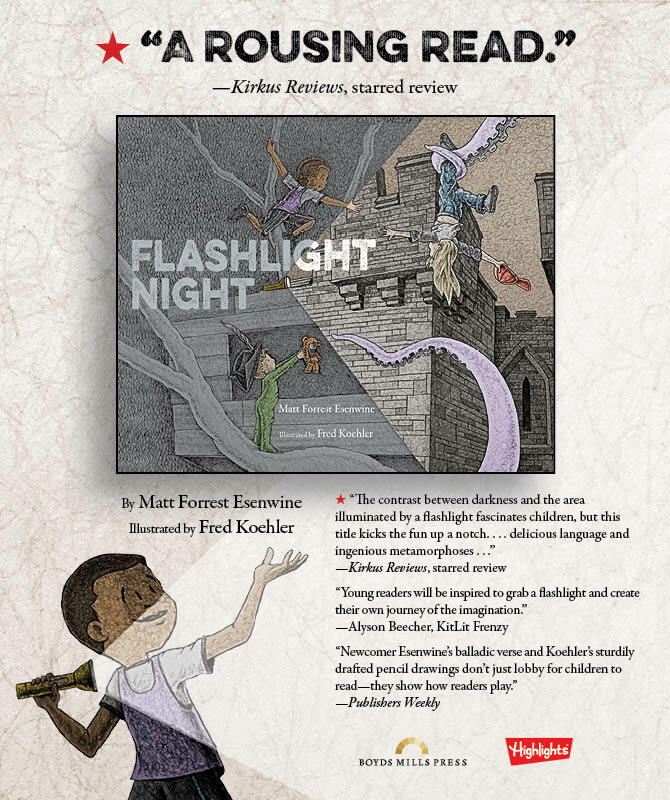 I also just learned last week that Flashlight Night will be receiving a STARRED REVIEW from Kirkus…I’ll be sure to share the complete review once they publish i can’t thank Boyd’s Mills Press, my editor Rebecca Davis, our illustrator Fred Koehler, and of course, YOU for helping this all to be possible…so thank you! 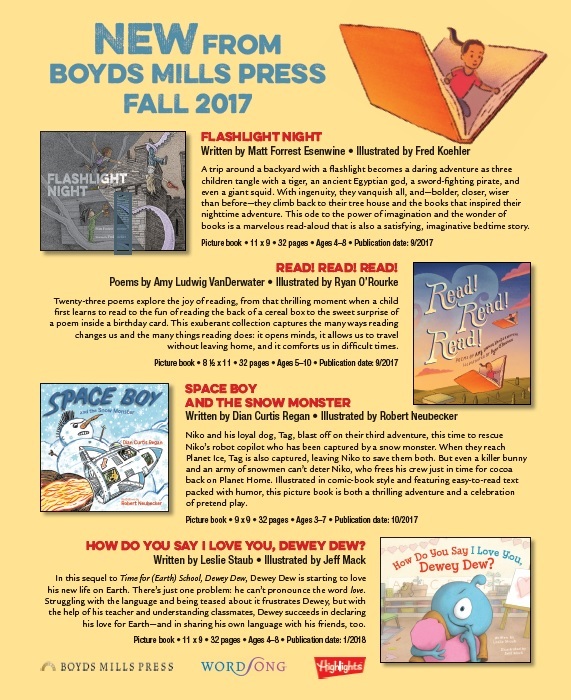 Flashlight Night (Boyd’s Mills Press) hits bookshelves Sept. 5, 2017, and pre-orders are available now through Barnes & Noble and Amazon, or by clicking the image of the cover to the right. 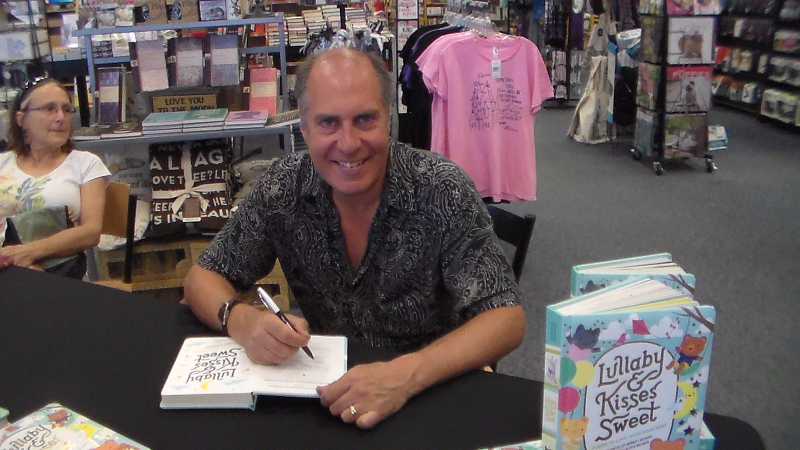 Of course, if you prefer, you can always wait til Sept. 5 and purchase it at your favorite local independent bookstore. Thank you again for being a part of this journey…and for being willing to sit through 400 posts! When I started this little blog nearly 5 years ago with my very first post back on Aug. 1, 2012, I had no idea what lay in store – for the blog, or my career! It’s nice to know both have been chugging along quite nicely. 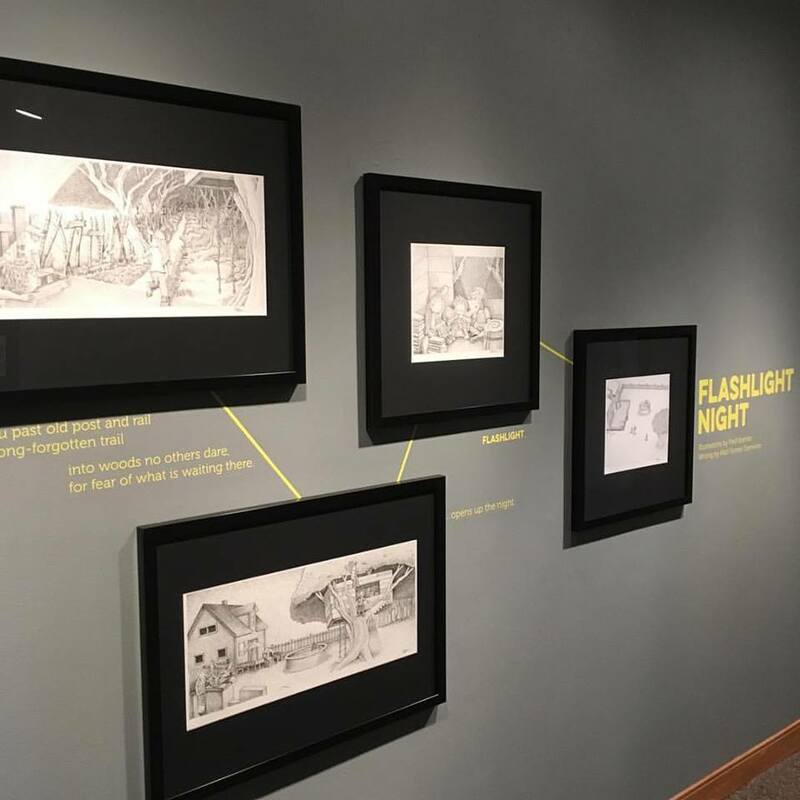 I just spent this past weekend in Springfield, MA, at the 2017 NESCBWI conference, chatting with fellow children’s writers and illustrators, learning from others in the business, and even getting to have a spur-of-the-moment dinner with former U.S. Children’s Poet Laureate Kenn Nesbitt, who happened to be in the area, Friday night. So imagine my surprise and delight when I finally got back home after three exhaustively long days, and found this in my mailbox! I knew the poem was going to be published this spring, but had no idea which issue until I heard from a couple of friends they’d seen it last week…so I was thrilled to receive a couple of contributor copies so quickly! That’s right, my first copy of my first book – from Highlights’ book publishing division, Boyd’s Mills Press! I had shared the F&Gs (folded & gathered pages) last week, but it was an entirely new experience actually holding the complete book in my hands and flipping through the bound pages. 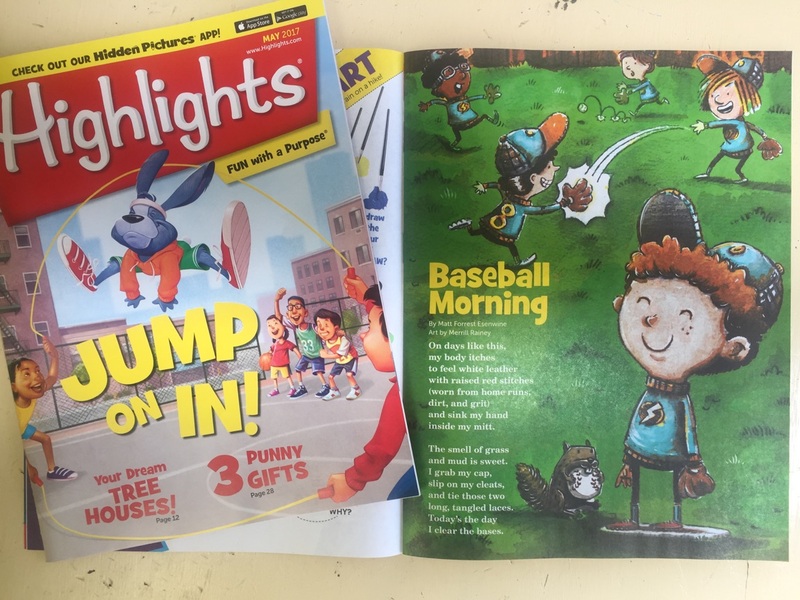 I am so honored by the work that illustrator Fred Koehler and the book designers at Boyd’s Mills Press have done…and so grateful to my editor, Rebecca Davis, for her support of my manuscript and the entire project! 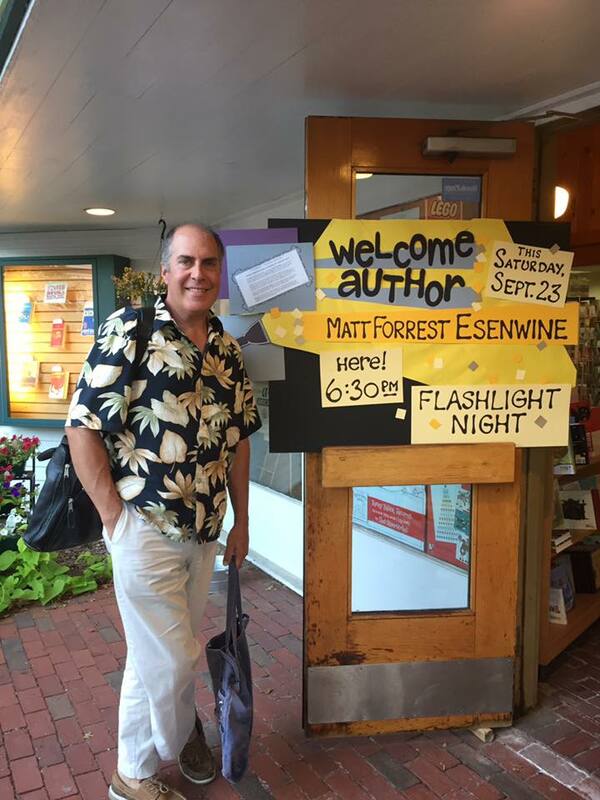 Flashlight Night (Boyd’s Mills Press) hits bookshelves Sept. 5, 2017! Pre-orders are available now by clicking the image of the cover to the right, or if you prefer, you can wait til Sept. 5 and purchase it at your favorite local bookstore! You still have a few days left to enter my month-long writing challenge, “Poetry…Cubed!” which is based on the premise of the TV show “Chopped!” on The Food Network. Use the 3 images below as inspiration to write a poem – any form, any genre, any number of lines, rhyming or not. Remember, it doesn’t have to be very good- the mantra around here is to #WriteLikeNoOneIsReading! 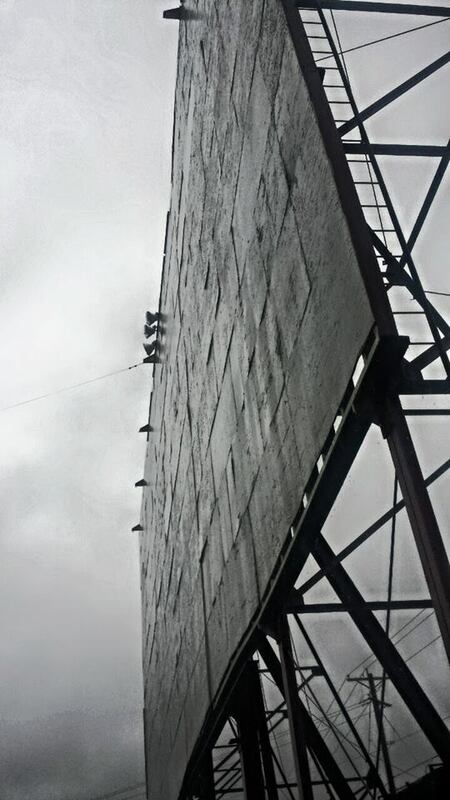 This is all about having fun and spurring creativity. The only hitch is that you need to include a reference to all three images in the poem – either via concrete imagery or something more abstract. Then email your poem to me at Matt (at) MattForrest (dot) com and I’ll share them here on Fri., April 28. Out of all the poems submitted, one lucky writer will be chosen at random to receive a copy of the Poetry Friday Anthology for Celebrations (Pomelo Books, 2015). There are only a few days left, so send your poem in to Matt (at) MattForrest (dot) com by Thur., April 27! ALSO: Irene Latham‘s annual Progressive Poem continues! Each day throughout April a different person adds a line until we have a complete, 30-poet poem on April 30! 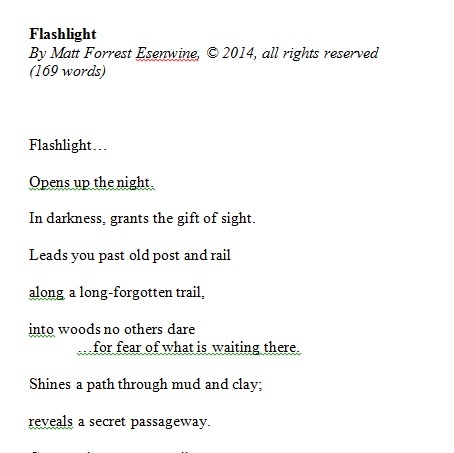 Poetry Friday: “Flashlight Night” advance peek! Month?? Even though it’s not a book of poetry, it is still a very “poetically-written” sort of book, and I’m so thrilled to have received something we call f&g’s (folded and gathered) in the mail yesterday. These are like advance review copies, although they are loose pages and not bound. But they are a great way to see the finished product before final production gets underway…and I’m stunned at how beautiful it’s looking! …and believe me, you’re going to want to enlarge…! 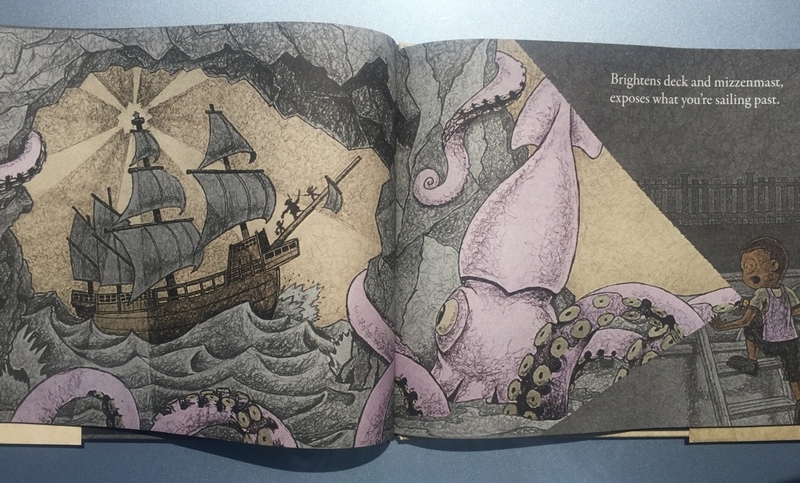 Hasn’t illustrator Fred Koehler done an amazing job? 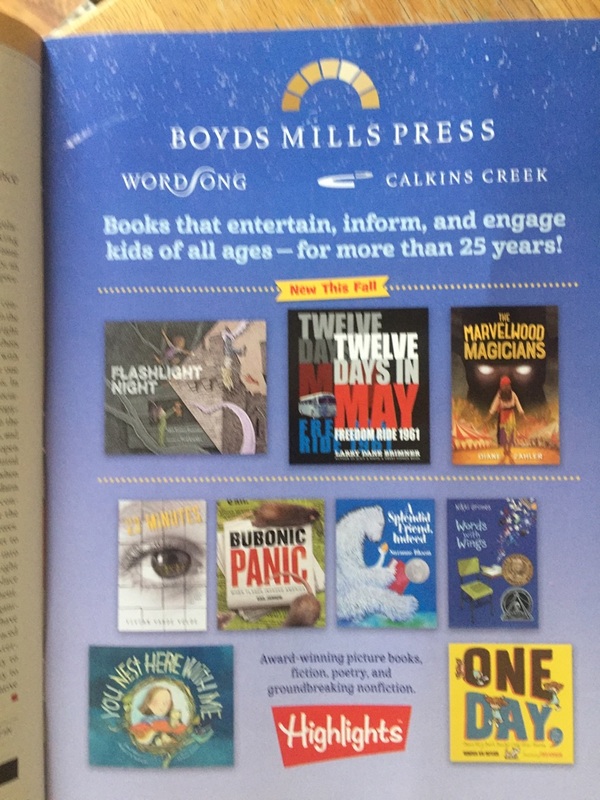 I also have to give credit to the book designers at Boyds Mills Press for creating a partial glossy cover – most of the cover is a matte finish, but the flashlight beam is glossy, which really makes the cover stand out. I couldn’t be more proud! Pre-orders are available now by clicking the image of the cover to the right, or if you prefer, you can wait til Sept. 5 and purchase it at your favorite local bookstore. As for today’s poem, I have two! These are entries in this little month-long writing challenge I call “Poetry…Cubed!” which is based on the premise of the TV show “Chopped!” on The Food Network. Sit. 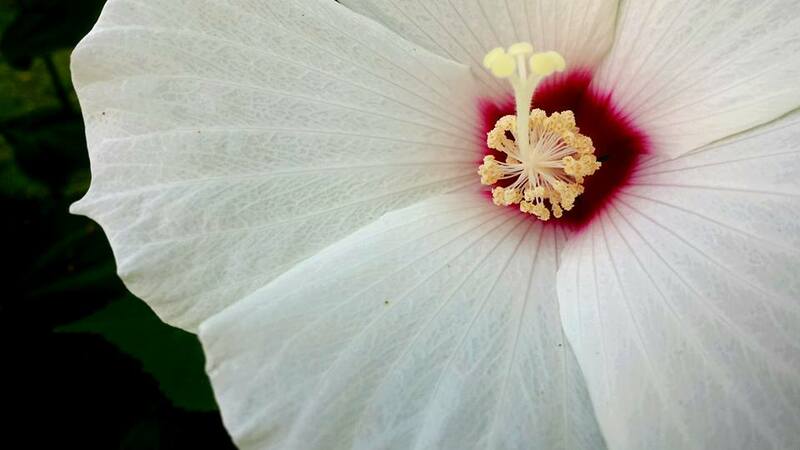 Look long into that bloom. I love how the word “iris” ties all three pictures together (a flower, an eye, and a drive-in movie screen – which needs a camera’s iris to create a motion picture)…that never even occurred to me when I selected these photos. You’ve still got two weeks left, so send your poem in to Matt (at) MattForrest (dot) com before Thur., April 27! ALSO: Irene Latham‘s annual Progressive Poem continues! Each day throughout April a different person add a line – until we have a complete, 30-poet poem on April 30! If you’re still looking for more poetry, Doraine Bennett is hosting Poetry Friday today at Dori Reads, so head on over for the complete poetic roundup! 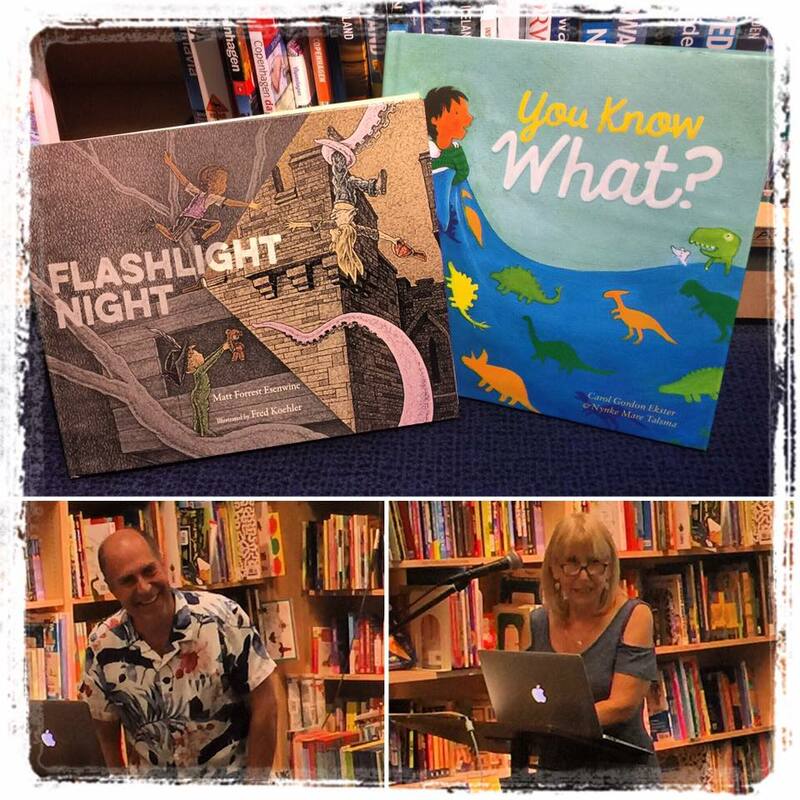 Poetry Friday: “Flashlight Night” cover reveal!! 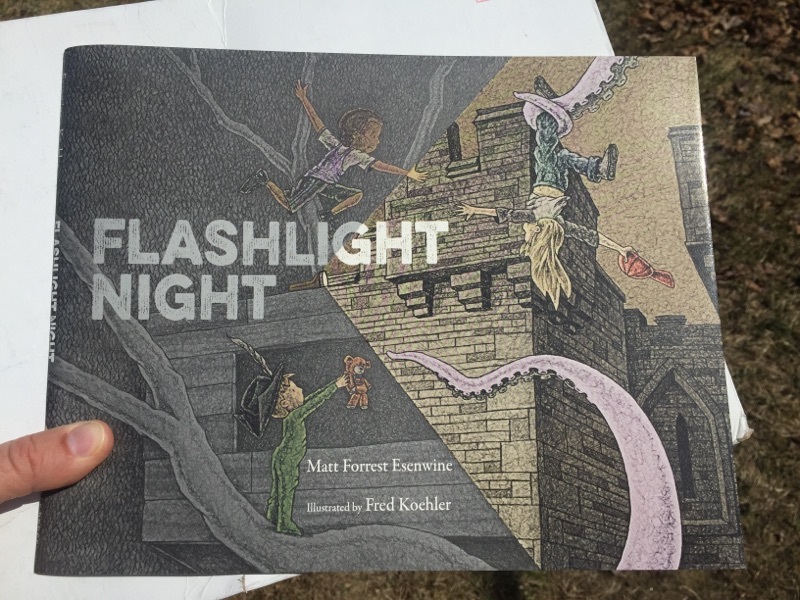 So begins Flashlight Night, my debut picture book illustrated by the incredibly talented Fred Koehler and published by Boyd’s Mills Press. Today is an exciting day for me…I not only get to reveal the cover, but I also get to share the RELEASE DATE! 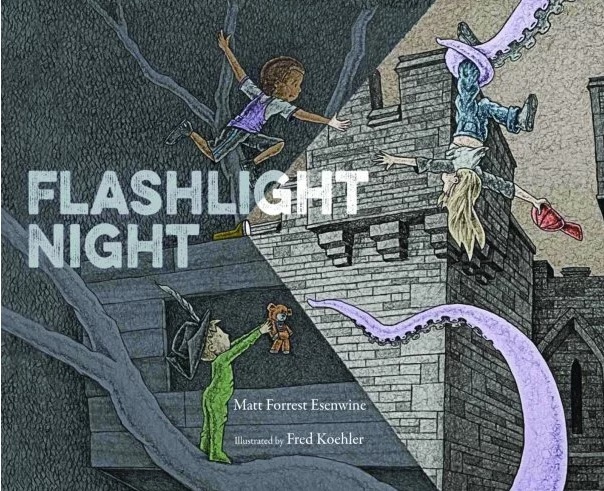 Flashlight Night is an unusual bedtime story about three children who discover unexpected adventure with just a flashlight and their imagination. And while most folks may not think of a picture book as being typical “Poetry Friday” material, I wrote this manuscript very ‘poetically,’ so to speak. 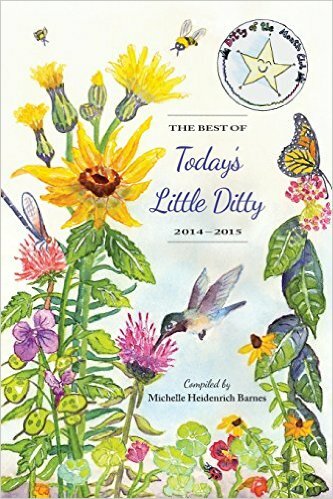 I began writing it as a poem on my way home from a gathering of local SCBWI members in the summer of 2012 – not really knowing where it was going or what it would become – and by the time I got to my computer, I had most of the first and 2nd stanzas completed. The next day, I worked on it some more, still trying to flesh out the middle…and by the end of the week the first draft was completed! I will always remember getting that phone call from my editor at Boyd’s Mills Press, Rebecca Davis, the following January, telling me she and the editorial staff loved it and wanted to buy it. And I’m so grateful for Rebecca’s guidance and support! 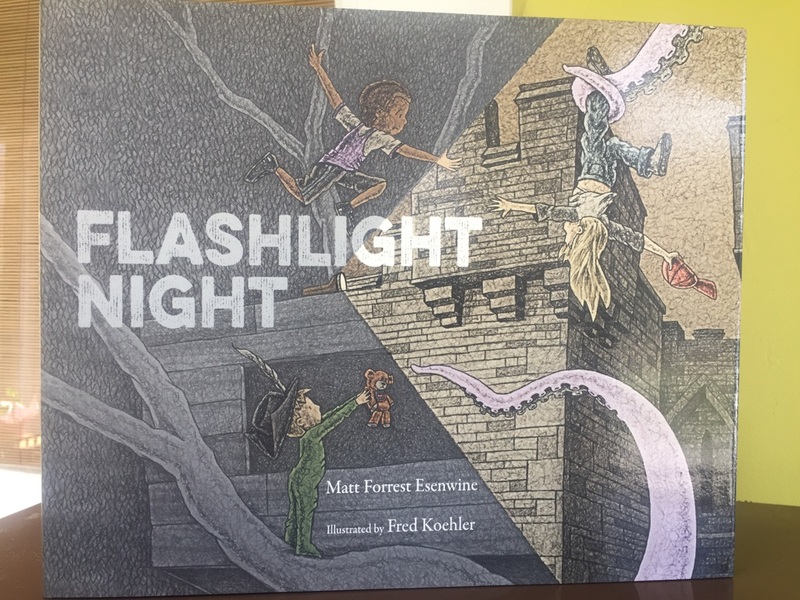 Fred Koehler did an amazing job with the illustrations, creating a second, underlying narrative to my text…and was so taken with the story when it was first presented to him, decided this would be his first-ever picture book illustrated using traditional media (pencil, pen and ink). 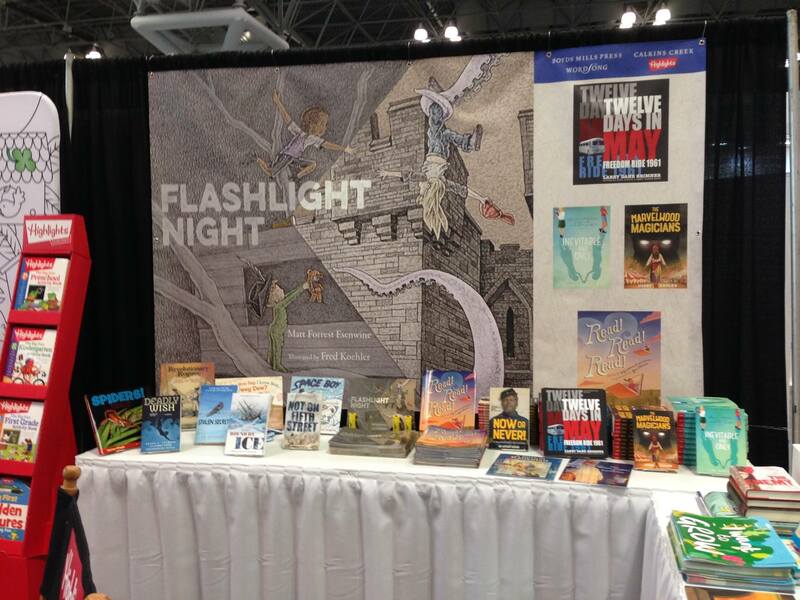 Flashlight Night hits bookstores Sept 5, but is available to pre-order on Amazon already! Of course, if you would prefer to wait until it arrives at your local bookstore, that’s great, too! And remember, since it’s Friday, there’s all kinds of cool poetry out there in the blogosphere…be sure to stop by Life on the Deckle Edge, where Robyn Hood Black is hosting Poetry Friday! Poetry Friday is here – with AWESOME news! A town-wide brownout that fried my computer. A family of four battling the worst cold we’ve had in years, simultaneously. I’ve got a book deal!! 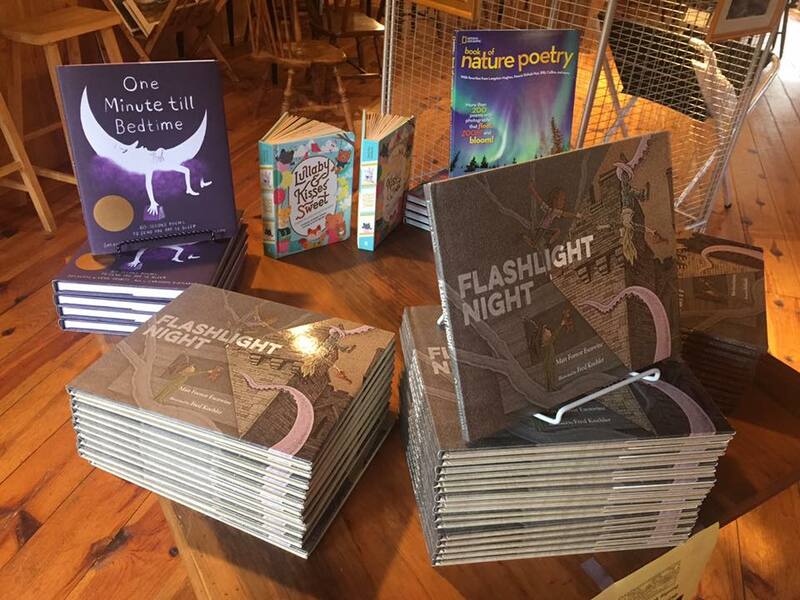 It is a pleasure and an honour to announce that I have signed a contract with Boyd’s Mills Press (one of Highlights magazine’s book publishing divisions) to publish my very first full-length picture book, Flashlight Night! I’m also very proud to have the wonderful and highly-esteemed Rebecca Davis as my editor…and now that the manuscript is approved and we can move forward, we’ve been discussing possible illustrators. A few have come to mind, so we’re hopeful one of them will work out! 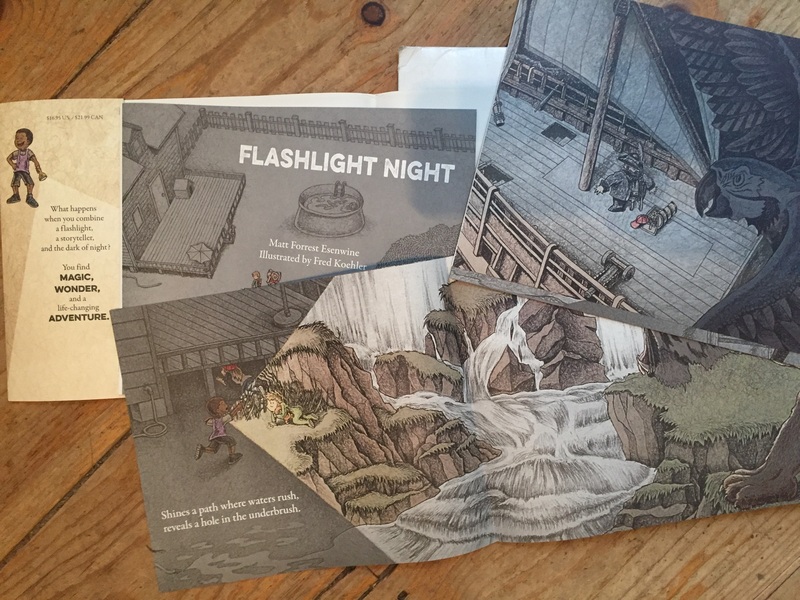 What is Flashlight Night about? Well, let’s just say it’s a poetic adventure that’s not what it seems. I’ll tell you more as we get closer to publication, which we hope will be in 2017. Keep checking back here for updated posts! This is a tanka – a Japanese form that is similar to haiku but is two lines longer and actually predates the haiku – and was written rather quickly (about half an hour) as part of a Facebook challenge. 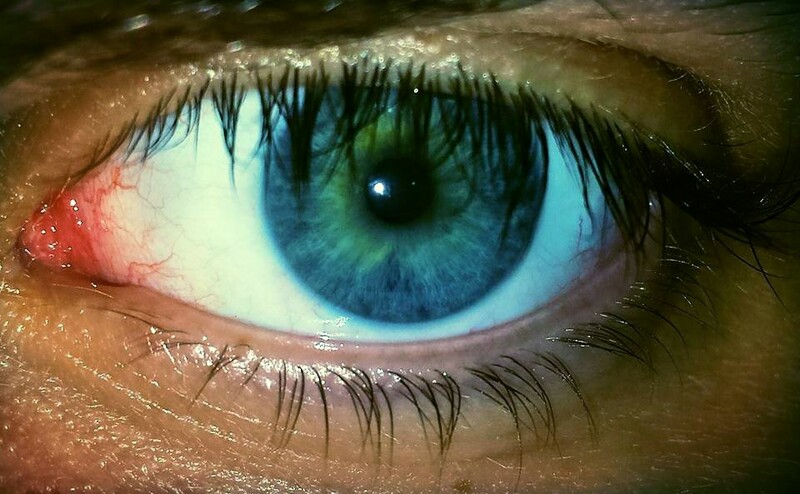 I was tagged to share four poems in four days by Heidi E.Y. Stemple, the daughter of Jane Yolen and a fine author/poet in her own right, with the requirement that I share each one on my Facebook wall. What will I write tomorrow? No idea! But feel free to connect with me on Facebook (or Twitter, Pinterest, or anywhere else you may find me) and we can keep up with each other! As you probably know from the title of this post, I’m hosting Poetry Friday today – so please leave your links in the comments and I’ll update the post throughout the day. I’m looking forward to seeing what everyone is up to! Laura Shovan shares an excerpt from a new medical poetry anthology (yes, you heard right!) 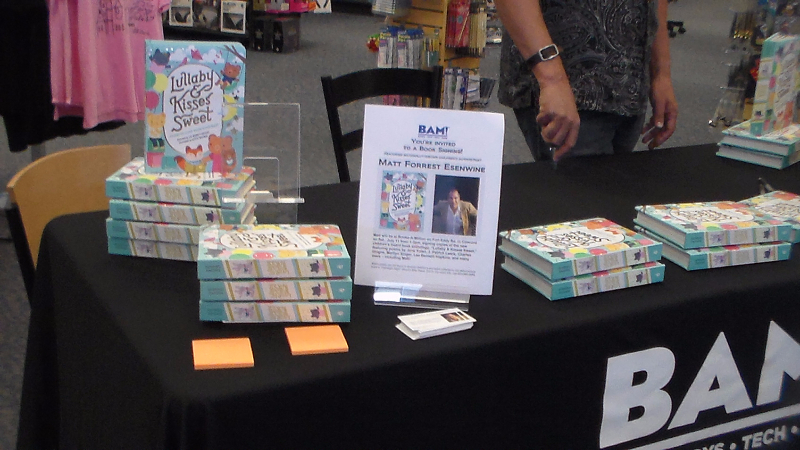 at Author Amok. 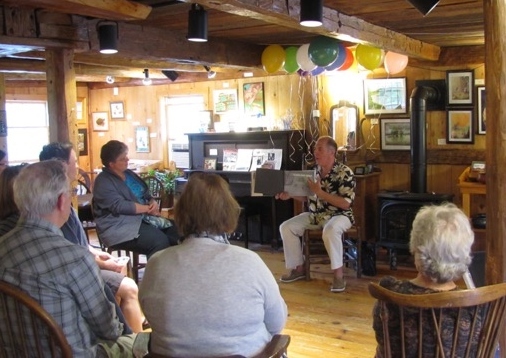 Fellow Granite Stater Diane Mayr recaps her time spent – and a poem written! – at the Massachusetts Poetry Festival at Random Noodling; meanwhile, over at Kurious Kitty, a touching Mary Oliver poem pays tribute to one of Diane’s co-workers. Laura Purdie Salas find inspiration for her “poetryaction” series of poems from Jamie Swenson’s book, If You Were a Dog, at Writing the World for Kids. What does Pompeii know? Linda Baie shares a poem about that exact question! It was written by a 5th-grade student, and you can see it at Teacher Dance. 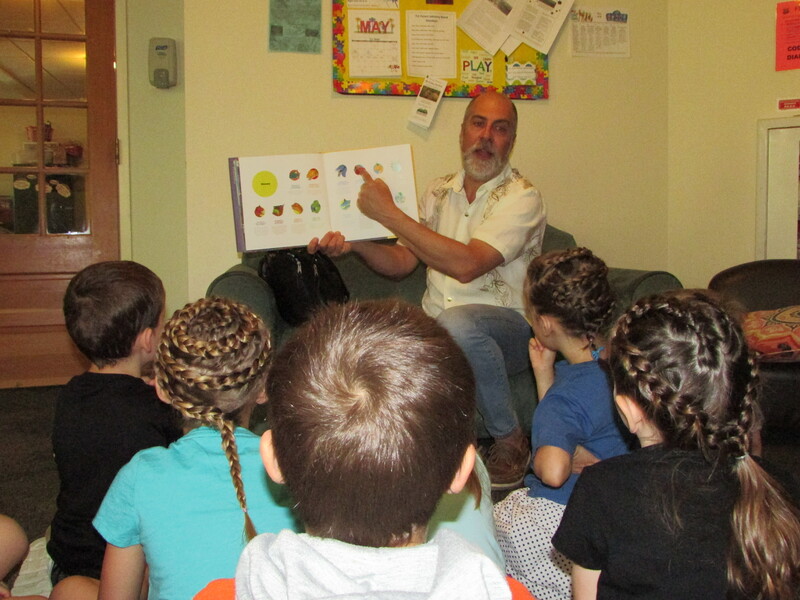 Tara at A Teaching Life shares a poem by Gregory Djanikian that seems to speak to all those affected by the end of the school year – the students that are leaving, as well as the teachers that are saying goodbye. Over at A Year of Reading, Mary Lee Hahn also says goodbye to another school year with her original poem. In the “Haiku Garden” of Today’s Little Ditty, Michelle H. Barnes features a haiku by award-winning writer Loree Griffin Burns. 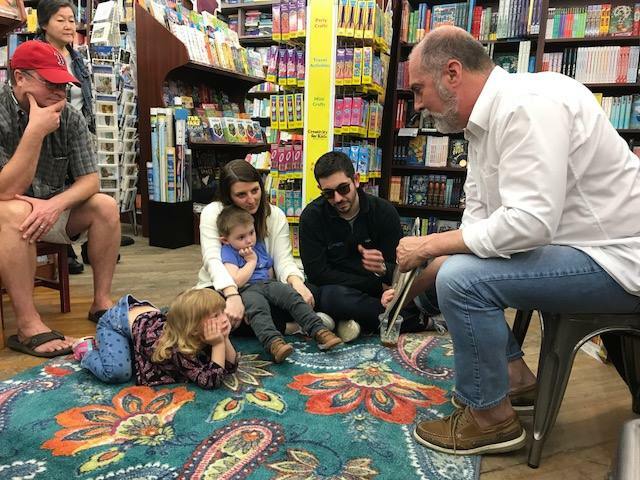 I love to hear about young children writing – and Jone MacCulloch recently received a poem from a first-grader, which she shares at Check It Out. 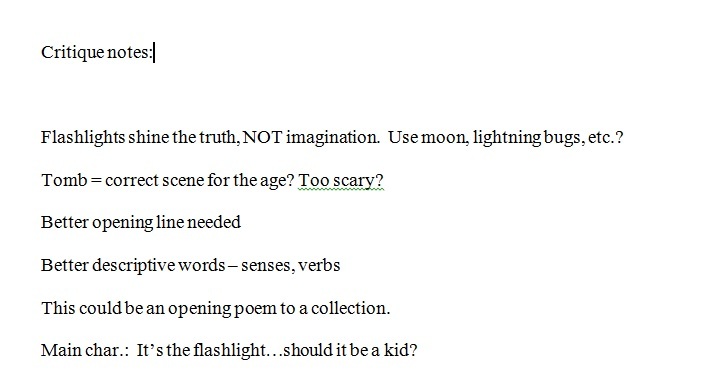 Sally Murphy spent three days at a young writers’ festival and was poetically inspired! Donna Smith is very proud of a 2nd-grader she’s been working with, who just wrote her very first poems! She shares them both, along with two original poems of hers, at Mainely Write. Have you ever “doodled while you listened?” That’s what Heidi Mordhorst is doing over at My Juicy Little Universe, as she shares a page from her writer’s notebook. If you’re a fan of nursery rhymes, be sure to check out Irene Latham’s review of the new anthology, Over the Hills and Far Away, at Live Your Poem. It’s Chalkabration time at Reflections on the Teche, where Margaret Gibson Simon shares some poems in chalk that her students wrote just as the school year was coming to a close. Keri Collins Lewis accepted a poetry challenge from Nikki Grimes and shares her success at Keri Recommends. This Sunday is Bob Dylan’s birthday, and Jama Kim Rattigan is celebrating with all things Bob…and a meatball recipe! (Yes, there IS a connection) Visit Jama’s Alphabet Soup for the details. There’s still no water at the No Water River…but there IS Douglas Florian! 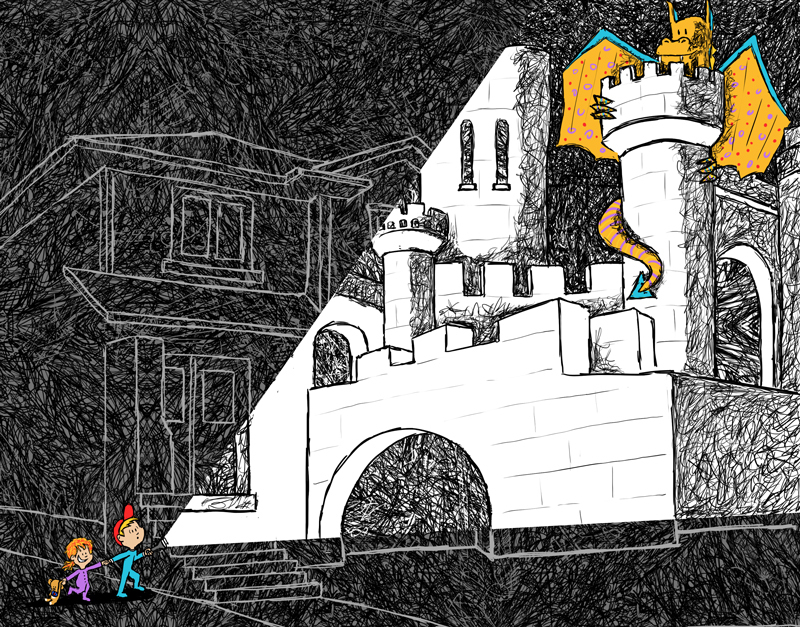 Renee LaTulippe interviews the author/poet/artist/illustrator/all-around good guy about his brand-new book, How to Draw a Dragon. 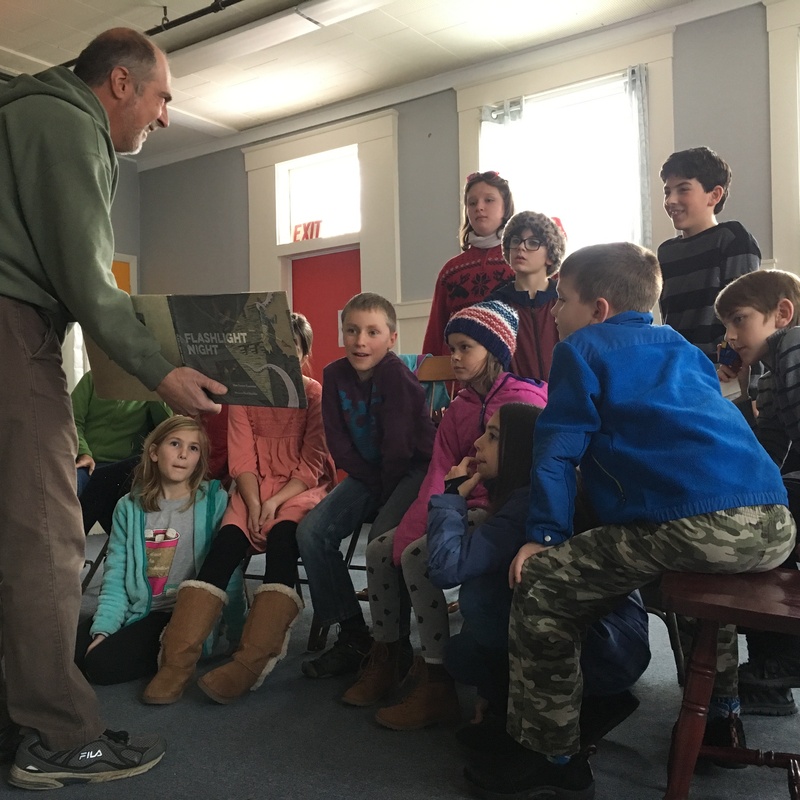 Amy Ludwig VanDerwater shares an original poem about writing at The Poem Farm – and is hoping you’ll share your notebooks! 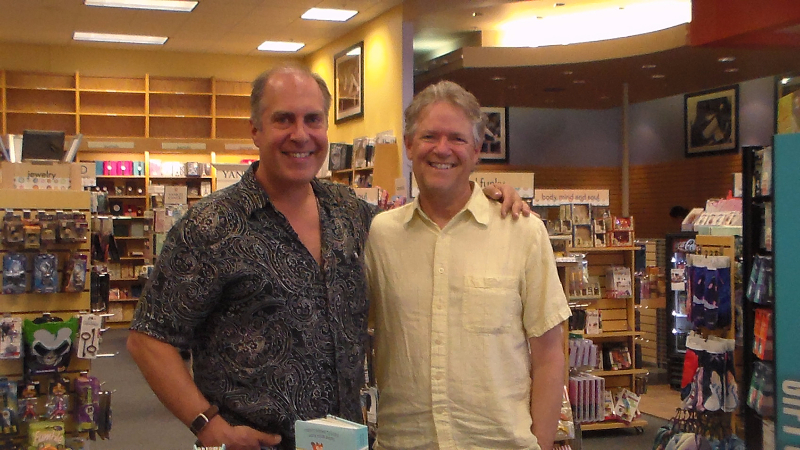 What do Edwin Markham and Mark Knopfler have in common? Aside from the obvious “mark”s in their names, they have Tabatha Yeatts – who shares some words of wisdom from these two gentlemen at The Opposite of Indifference! At There is No Such Thing as a God-Forsaken Town, Ruth is gearing up for her daughter’s last day of high school and shares a poem from the Poetry Friday Anthology for Middle School. Catherine Johnson is celebrating Armadillo Day (ok, that’s a made-up thing, but they SHOULD have its own day, shouldn’t they?) with poems by Eric Ode and Douglas Florian, and her original artwork. Fats Suela shares two poems by Naomi Shihab Nye, one of the world’s most popular and influential poets (and a favorite of author/poet Kwame Alexander). Head on over to Gathering Books for the poems as well as background info on Nye and her writing. At Dori Reads, Doraine Bennett reviews Susan Van Hecke’s Under the Freedom Tree and also shares a poem from it. 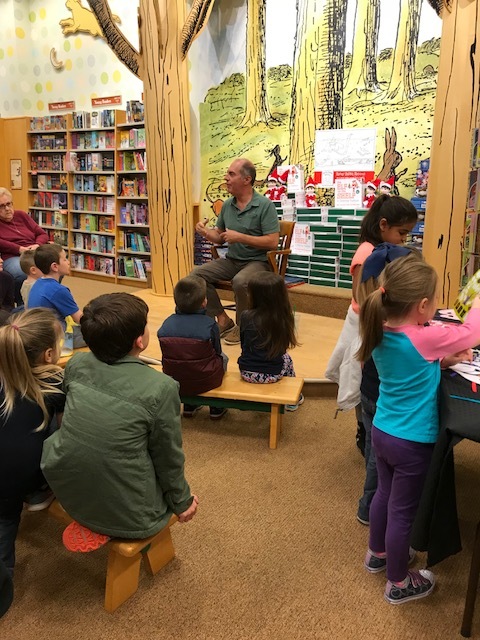 Otto the Owl Who Loved Poetry is a new book out by Vern Klousky, and Lorie Ann Grover shares a snippet from the book at ReaderTotz. Lorie Ann also shares an original haiku at her blog, On Point. Holly Thompson interviews Margarita Engle in Sylvia Vardell’s latest Poet-to-Poet interview series…check it out at Poetry for Children. You can also visit Holly’s blog, Hatbooks, to read more about her interview! Little Willow shares a piece from Martha Brockenbrough’s novel, The Game of Love and Death, at her blog, Bildungsroman. Last but certainly never least, Joy Acey is in the middle of the same “4 poems in 4 days” Facebook challenge that I’m a part of, and she already has two poems up on her blog, Poetry for Kids Joy. THIS JUST IN! Carol Varsalona is discussing inspiration, process, and notebooks at Beyond Literacy, as she takes part in Amy Ludwig VanDerwater’s “Sharing Our Notebooks” project. ALSO JUST IN! 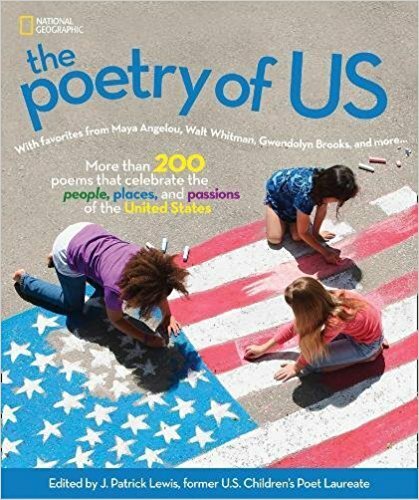 At Pleasures from the Page, Ramona is enjoying several poetry books by Barbara Esbensen and shares one of Esbensen’s poems – just in time for the end of the school year.